As Summer comes to a close, we're looking forward to gathering in the warmth of our community, making time for prayer and healing, and finding ways to deepen our love for Christ. So what are we planning for Fall? A lot! We're gearing up to raise funds for local Golden charities with the Helping Hands Hustle 5k (Can't make it? Be sure to sign-up for the "Sleep-in" category). We're also super excited about launching our Digital Small Groups that will allow you to participate in Bible Studies from the comfort of your home at times that are convenient for you. You can find details about this, and more, below. As always, we're so thankful to all of you for volunteering at events, supporting our ministries, and joining us in celebrating Mass each Sunday. We're blessed to have you as part of this Parish. 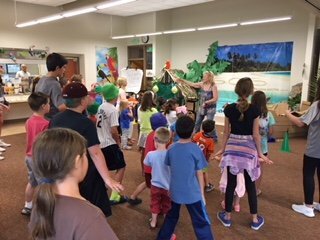 The Parish children had so much fun at Vacation Bible School where they learned that Jesus will carry them through life's storms. At the Parish Picnic, we gathered together for Mass followed by a picnic on the field. 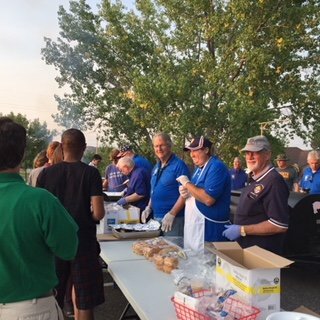 Our Knights of Columbus cooked up some delicious hamburgers, brats, and hot dogs, while the children enjoyed a magician and bouncy castle. We would like to sincerely thank everyone who accepted the challenge to "Adopt-a-Pot in God's Garden" this Summer. 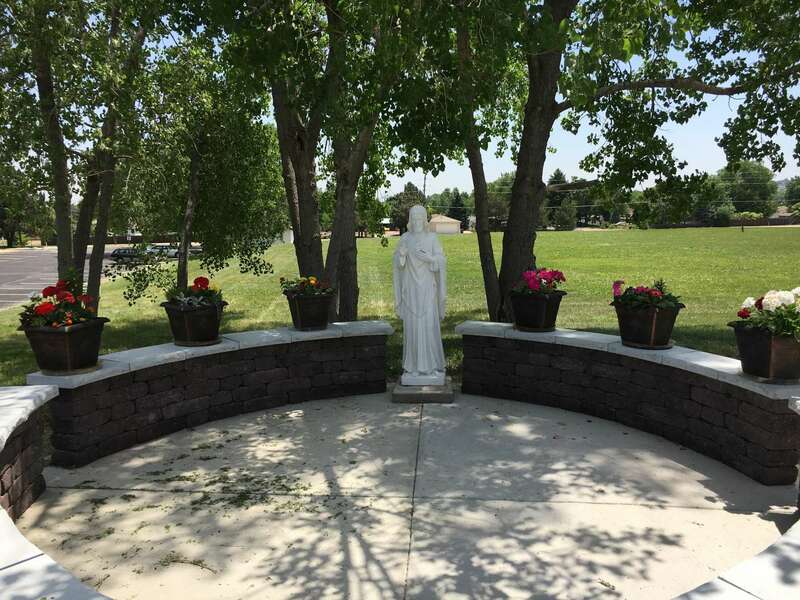 Your dedication to our parish not only made our campus more inviting, but made it a more beautiful place for Jesus. If you would like to see more pictures of the flowers, please see our Facebook page @StJosephGolden. Instructions for Fall pot returns can be found in the bulletin. This Fall, St. Joseph is offering Digital Small Groups for the very first time. We are extremely excited about providing our parishioners with a way to grow in their faith in a way that can fit in to any schedule. We know that many parishioners are unable to join in weekly "on campus" Bible Studies due to conflicts with their work or family schedules. With our new Digital Small Groups, you will be able to grow in your faith on your schedule. 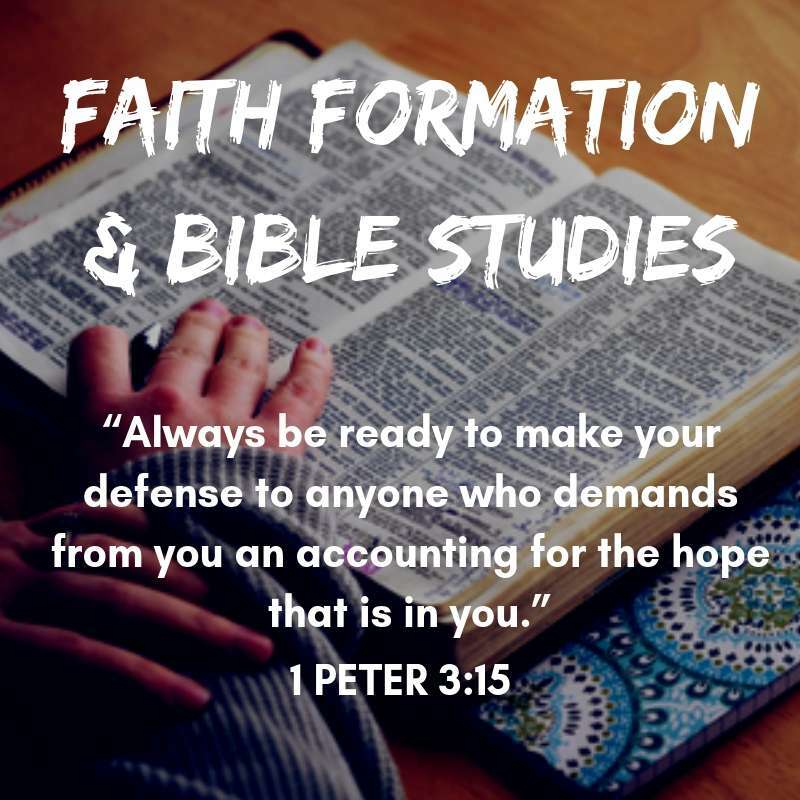 Each of these online studies consists of a 20-30 minute video each week (that can be watched on whatever day of the week and whatever time of day works for you), as well as an online small group discussion group with other St. Joseph parishioners working through the same study as you. Maybe you choose to sacrifice watching one episode of your favorite show each week to participate in a Digital Small Group or make a commitment with your spouse to make a weekly "date night" out of it? Please see below for our "menu" of Digital Small Group studies we are offering this semester and how you can sign up! Presence: A short 3 week study on the Mass. High quality videos, moving testimonies. Lectio Eucharist: An in-depth 10 week study on the Old Testament and New Testament foundations for the Mass. This study will make a profound impact on your experience each Sunday at Mass. 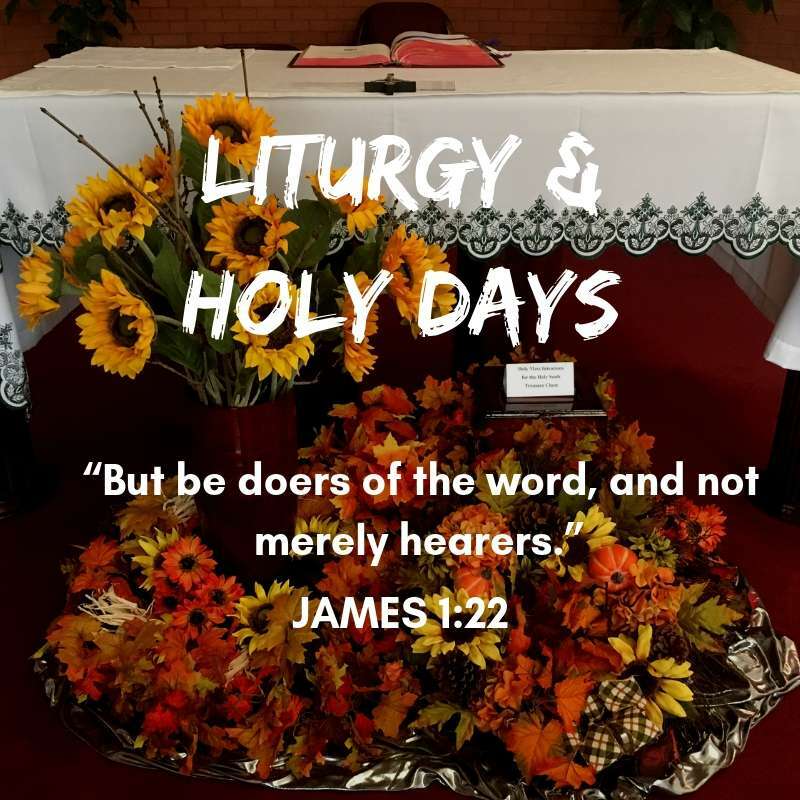 The "Combo" Study: The best 7 session from the Presence and Lectio Eucharist studies. A little taste of both! How to sign-up: Log into your free account on Formed.org to sign up for one of these courses (use our parish code: 4d0489 to register for a free account) and sign-up under the "COMMUNITY" tab. For full instructions with pictures, click here. Prayer: Bishop Barron's 4 week study that focuses on helping you continue to grow in your personal prayer. The Eucharist: Bishop Barron's 6 part study on the Mass. Heroes of the Faith: Bishop Barron's brand new "Pivotal Players" study on 6 key Catholic figures. Shot on location all around the world. Stunning cinematography and moving reflections. How to sign-up: Reply to this flocknote to sign-up for one of these studies with the word Prayer, Eucharist, or Heroes (reply with multiple words to sign-up for multiple classes!). These studies will all "open" simultaneously on Sunday, September 30th. Join the World Apostolate of Fatima with spiritual director Fr. Michael Freihofer for a beautiful evening of prayer and fellowship. Brown scapular enrollment will be available. Mass will be celebrated at 6:00 pm with the Rosary Procession to follow at 7:00 pm. Celebrated at the 11:00 am Mass, this rite is the first rite in the RCIA process and serves both unbaptized and baptized non-Catholics who are seeking entrance into the Catholic Church. For the unbaptized, this rite marks their entrance into the "Order of Catechumens." For baptized non-Catholics, this rite offers them a chance to receive the blessing of the Church as they continue their catechetical instruction on their journey towards Confirmation, Eucharist, and full entrance into the Church. The on-going prayers of our local community play an irreplaceable part in the RCIA process and we encourage you to attend this Mass and offer your prayers for those adults and children on their journey of faith into the Holy Catholic Church. Our monthly Encounter series provides opportunities to encounter God through different prayer experiences. Please watch the bulletin and website for details about the schedule of our prayer service. We hope you'll take advantage of some of our events this semester! Masses for this holy day of obligation will be at 8:00 am and 6:00 pm. We will celebrate Mass at 5:15 pm on Friday and 9:00 am Saturday in the Golden Cemetery. Please join us for our November Encounter event. We will be celebrating Mass and Adoration of the Blessed Sacrament with about 20 first class saint relics. Led by Gary Bishop and Maura Burns, our Youth Choir is open to children 4th grade through 12th grade. Rehearsals are on Tuesday Nights from 6:00-6:45 pm in the Church. The Youth Choir sings at the 11:00 am Mass on the last Sunday of each month during the school year (excluding December). Please join us for our annual 5k, organized by the St. Joseph Catholic Parish Community Outreach Program, to raise fund for the Christian Action Guild, Golden Backpack Program, and Golden Rescue Fund. Registration materials can be found in the Gathering Area of the Church and at the Parish Office. We're finally bringing back donuts! We will have donuts along with coffee, juice, and milk after the Masses on the first weekend of the month. 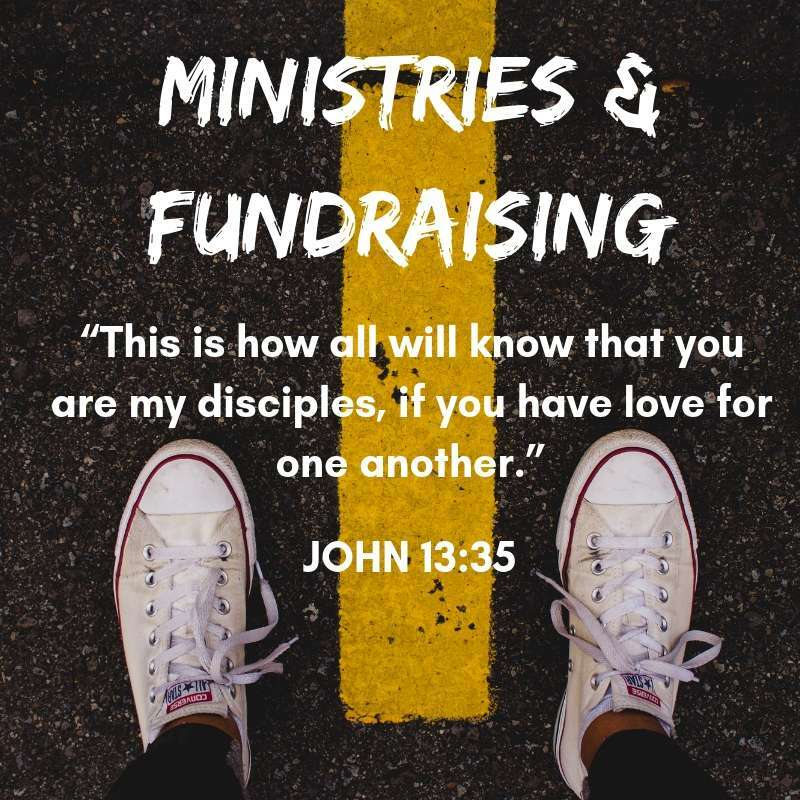 A $2 donation is suggested to help us raise money for our Youth Ministry. Thanksgiving pies can be ordered on the weekends of November 10th/11th and 17th/18th. The pies come from Village Inn. Pies will be available for pick-up on Wednesday, November 21st from noon to 6:00 pm. Funds raised benefit the Confirmation students. All children are welcome to participate in Religious Education and Youth Ministry. The purpose of these programs is to aid parents in their primary role as catechists by providing a welcoming faith-based learning environment. Children pre-k to 5th grade participate in RE, while middle schoolers and high schoolers participate in Youth Ministry. Students currently in second grade will be preparing to receive the sacraments of First Reconciliation and First Eucharist. Students currently in 4th and 5th grades will be preparing to receive the sacrament of Confirmation. Please contact the Office to register your child for these programs. This year we will be offering a brand new faith study exclusively to parents of children enrolled in our Religious Education program. This study will be offered at the same times as our RE classes and will follow the same calendar. We encourage you to journey alongside your children in a commitment to deepen your own faith during this RE year. This study will be offered twice each Tuesday night to correspond with the two sessions of RE and we will not have classes on Parent Nights so parents can attend classes with their children. ENCOUNTER is a retreat offered through the Archdiocese that can drastically impact your life. Through different sessions of worship, teachings, personal stories, and prayer, you will encounter the God who comes to meet you right where you are at in life! Cost is $40 and includes materials and meals. To register, click here. We are encouraging parishioners to attend this retreat as our September Encounter event. Our parish has partnered with 4 other local parishes to provide a unique and compelling young adult ministry called West Denver 2:42. You can learn much more about this ministry by checking our website here. If you are a young adult who's 21+, we'd love for you to join us for our next monthly gathering here at St. Joseph. St. Joseph will continue to host monthly Family Gatherings this semester. It's a great opportunity to grow in faith and friendship with other families at St. Joseph. The gathering begins after the 9:15 am Mass in the Education Center. We provide coffee and juice and families typically bring a small food item to share (baked goods, donuts, fruit, etc). After socializing for 30 minutes, the adults join in a group study together while the children have a chance to play. We are finished by noon. Come join us for our next gathering this upcoming Sunday! 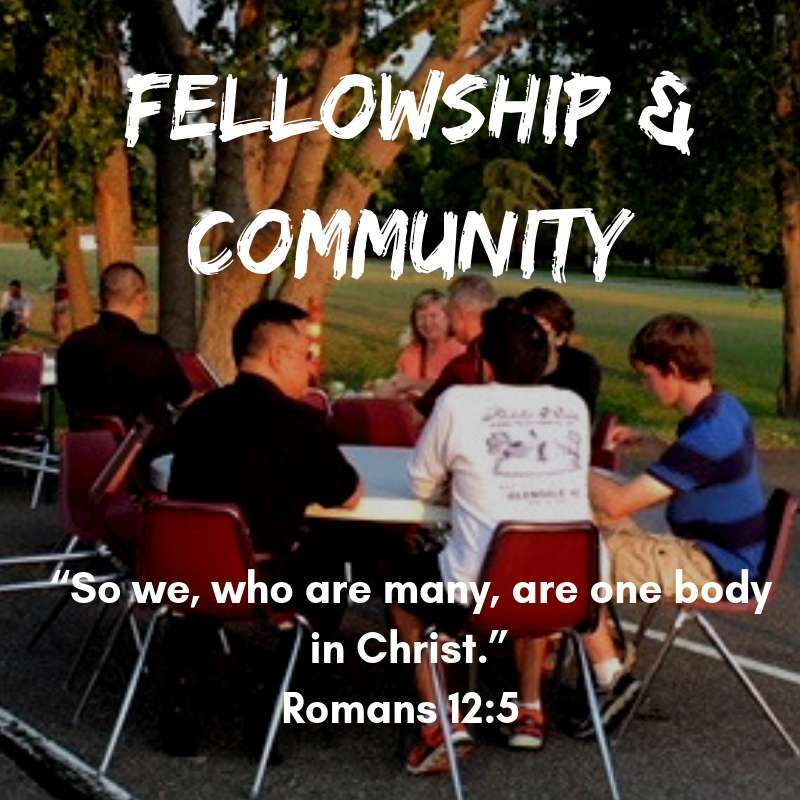 Please join us in the Education Center from 7:00-8:15 pm for dinner, as well as information about Middle School and High School Youth Ministry. Please join us at 2:00 pm in the Education Center to watch the Broncos play the L.A. Rams. Snacks, ice tea, and beer will be provided. Come cheer for the Broncos at a fun, family oriented viewing of the game. The women of St. Joseph gather 3-4 times a year for an evening of faith, fellowship, and fun. We start with Adoration of the Blessed Sacrament and Mass, followed by a potluck dinner and fun activity. Please join our Flocknote group to stay in the loop. Thank you for taking the time to read the Fall newsletter! Additional information can be found on our website HERE and in the weekly bulletins. Why am I receiving this note? You are receiving this note because you are a registered parishioner at St. Joseph in Golden or have signed-up for the Flocknote Group for St. Joseph in Golden. If you are no longer a parishioner, wish to update your contact information, or are receiving multiple emails or texts for one household (and prefer not to), please email Audrey Goshorn (audreyg@stjoegold.org) and your information can be updated according to your preferences. We want to make sure that we are only sending you information you want to receive so please don't hesitate to contact Audrey with any communication request so we can best serve you! Thank you so much for helping us keep our records up to date.